Back in 98 and 99 when we had the studio at 1650 Broadway going, we worked on a wide variety of recording, engineering, and writing projects. Some of those were klunkers, which we were doing just to get established, but one or two were sheer gold. The best example of the latter category was the work we did with a super talented young R&B singer named John Stephens. DC, our studio mogul and musical genius in his own right, had known John through a vocal jazz group they had both directed back in Philly. So we worked with John on a four-song demo CD. My contribution to the project was some mixing, engineering and a few guitar tracks. On top of everything else, it was great fun since I had never worked in the R&B genre. We knew John was destined for big things, and he was already hitting it big, playing some piano tracks on the critically acclaimed and smash debut, The Miseducation of Lauryn Hill. On top of all that, John was just a nice guy to deal with. “I never knew the old Vienna before the war, with its Strauss music, its glamour and easy charm.” So begins The Third Man (ranking high on my ten great films list), in which the city itself fills out the ensemble cast. It occurs to me just now that in the course of the film, we travel through this meta-character, enter its mouth, see through its eyes, travel to the brain, to the heart and then finally, and most famously, end up in its guts, after which Harry Lime tries in vain to escape through a small circular opening. That’s all well and good, you say, but what does Wien have to do with Wein? This, mein freund, Austria is the land of not only fine audio (Germany is no slouch, either), but also the finest wine glasses on planet Earth. Here’s the thing, though, not only are these glasses the finest, they are also the best, an important distinction. Wine glasses are functional devices and the great majority of them fail to deliver. People have caught on to the fact that for serving good red wine, you need a glass with a large bowl for swirling, and a concave shape for capturing the bouquet. And yet it’s still common to see good whites served in tiny glasses, filled to the brim. Until yesterday, that had been the case at our place as well, but no longer. We’ve added a set of the Vinum Extreme Chardonnay glasses to the collection. 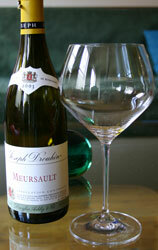 The first test drive took place last night with the lovely Joseph Drouhin Meursault 2003, pictured left. First off, like the other glasses in this collection, these are beautiful, and perfectly balanced. The extreme collection has sharper angles than the more traditional glasses. As you can also see in the picture, they are enormous! When I swirl, I mean business–think Pete Townshend–and these glasses are up to the task. The upper part of the bowl perfectly focused the Drouhin’s honey and light citrus notes. Drinking out of traditional “white wine glasses” is like trying to drink with your nose plugged, with these, it’s like you’re wearing a super deluxe breathe-rite strip. And that makes all the difference! Rings true? Then you may be interested in this study: Unskilled and Unaware of It: How Difficulties in Recognizing One’s Own Incompetence Lead to Inflated Self-Assessments. When you think of directors Harold Ramis and David Cronenberg, film noir is not the first genre that pops into your head. Cronenberg likes to blow things up good, real good. And come to think of it, so does Ramis. Well, at least that would apply to the Stay-Puft marshmallow man. But both directors turned out nice little neo-noirs last year. Ramis’ Ice Harvest on the other hand, is simply a straight-up neo-noir. With a femme fatale, a double-crossing partner, a sack of money, and corrupt-but-likeable protagonist, all the classical elements are present. The movie was marketed as a dark comedy, which may have left much of its audience unsatisfied. And indeed, there are a few Fargo moments here, but you can see why some movie-goers would have felt a little misled. No greatness here, but certainly enough for fans of the genre, or John Cusack, to latch on to. With its anti-Christmas themes, would pair nicely with Bad Santa. The Cedar Lounge–every city, big or small, must have had its own CBGB’s in the late ’70s and early ’80s. This was London, Ontario’s punk rock incubator. It was already closed down, and a legend, by the time I got anywhere near old enough to go to a bar or a rock club. And of all the rag-tag (sorry for the Battlestar Galactica reference, but it seemed right) groups associated with that London Aunt punk scene, the marquee band has to have been The Demics. “Demics Rule!” was spray-painted, I think, on the same downtown alley wall as the more cryptic invocation, “Wet Dog Fur.” Could it be this song that programmed my young, malleable brain with the mission to move to NYC? Well, let’s just say that it was a further data point. Thanks to CHRW, you can now listen to that whole album here. What was the punk club in your home town that you were too young to frequent? Dogville is the kind of film which leaves you completely bowled over, in that “wow…” state. Especially the “…” part. When Lars von Trier engages you, you feel it, viscerally, of course, but you are also left with many things to ponder. A heated coffee-shop philosophy chat that ends with chairs being smashed over heads. Or a few kidney punches. Some bruises at the very least. And as much as I would love to get into the ideas of this picture, I wouldn’t dare to give away a word of it. So please, everyone, once you’ve seen it, let’s talk. We’ll try to keep the violence level down, I promise. In the meantime, I’m going to see more of LVT’s flics. Hopped on the L train last night and wound up at Pete’s Candy Store. We’re still trying to figure out the whole Williamsburg thing–like where everything is and why you have to go to the back of the room to order a sandwich, or get funny looks if you ask if the red cab is any good. No matter, it’s for the youngins anyway, and they seem to enjoy it all right. We were there to check out Alessandro & Bando, packed into the Candy Store’s tiny, railway-car-like back room. Guitarist and composer Alessandro Ricciarelli was joined by guitarist and bassist Jerome Harris and percussionist (and fellow Berklee alumn) Satoshi Takeishi for an acoustic set. The Bando played a few traditional numbers alongside some of Ricciarelli’s own tunes, which I liked. Ricciarelli was born in Milan, grew up in Munich, studied jazz at Berklee, is a music therapist by trade, and also, I’m told, is a very good writer. He has a very understated vocal style, and ended the set with a very convincing Jobim impersonation. A nice set. And tho Bourbon Princess, the next act, looked & sounded interesting enough, we didn’t dally. Perhaps an everchanging top 5 section of what’s on yer turntable that is making you shake yer tailfeather type of thing. Perhaps I should mind my own business. Well Phil, if that is your real name, it’s funny that you mention this, because it’s been something I have been planning for quite a while. Hopefully, your note will prod me to actually do something about it this weekend. In the meantime, keep watching the skies!